Dump Trailer Details - Quasius Equipment, Inc.
Our Maxi-Dump 6 x 10 Dump Trailer is a real work horse. It's capable of hauling 8,000 lbs of yard waste, brush, gravel, concrete, dirt, or almost anything else. It's comes with hydraulic surge brakes and incorporates a hydraulic dump mechanism powered by an onboard 12 volt electrical supply. 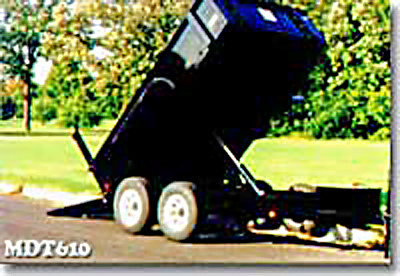 The 3 way tailgate setup can lower like a pickup truck gate, raise up in the spreader mode like a dump truck, or it can be split and swung out to each side for an open back end when dumping. The 20.5" tall sides can hold a 3.9 cubic yard payload and trap tie down rails ensure that bulky loads such as brush won't fall out on your way to the disposal site. It requires either pintle hook or a 2" trailer ball and a full size 3/4 ton pickup truck with class 3 frame mounted receiver hitch with a trailer lights hookup in order to haul it. Empty Trailer Weight 2,935 lbs. Empty Tongue Weight 281 lbs.